Mario Moreno Moyano, creative soul and product manager of the Italian brand Ottavio Nuccio Gala, presents his new collections 2019 for all types of weddings and social events, enjoy his collections, all of them with a stylized slim fit and completely tailored to your measurements for a bespoke fit and experience. How to define the different styles according to the personality, lifestyle, place and time where will be held the celebration or event? Population is divided into lots of social tribes, each one with its peculiarities and convictions; a traditional man will feel highly uncomfortable in a group of punk rock people, as well as a Hipster in a crew of b-boys and so on. From this situation, it begs the question: how can it exists only one fashion valid for all of these social tribes, so different from each other? Each one has its fashion, each one is fashion. To find the perfect groom suit, first of all one has to know what style is the best suitable for his personality and also the time and the place when and where the ceremony will be celebrated have to be considered. The perfect collection for a traditional man, which is distinguished by its elegance and attention to details of excellence. 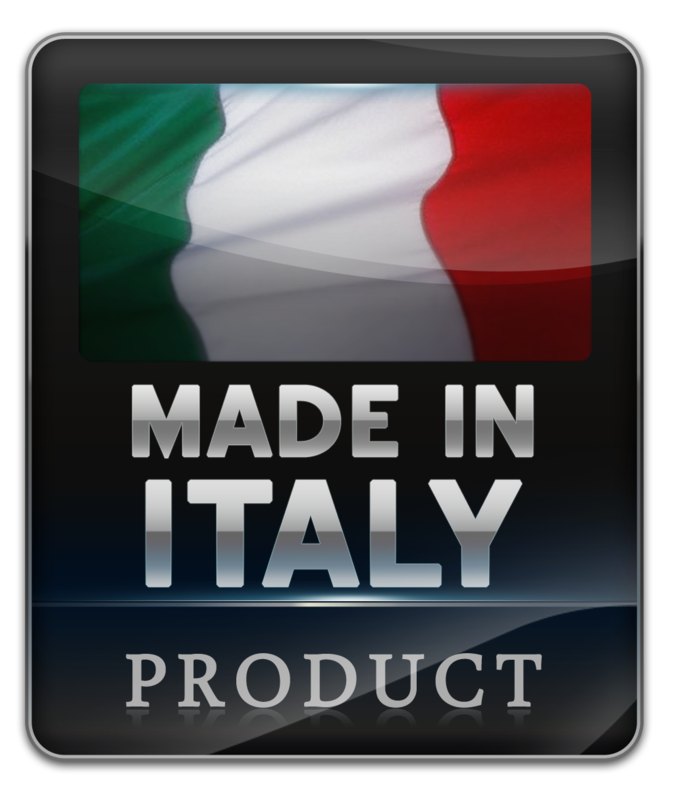 Completely “Made in Italy” tailored style wedding suits and morning suits. For a ceremony in the morning that is celebrated in a church, the family has a classical, conservative and traditional taste, the most appropriate model is the morning suit. What is very important to take into consideration that in case we choose the classical morning suit, is that the family members and the closest friends, should accompany the groom also wearing a morning suit. One piece jacket, without cut at the waist to highlight the figure. Wide range of colors and combinations, from the classical black morning coat with black and grey striped morning suit trousers to the elegant grey shades like light grey, charcoal grey, anthracite grey or patterns like wool “fil-a-fil”, wool silk, cool wool, mohair wool alpaca, the new trends colors like royal blue or navy, or vintage combinations with pattern like Prince of Wales and Houndstooth. But on the contrary if you are looking for the style of the morning suit but without being bound to the strict protocol, the perfect model would be the redingote, in different colors and patterns like “fil a fil”, wool silk, cool wool, mohair wool alpaca, Prince of Wales, Houndstooth, light grey, charcoal grey, anthracite grey, black, blue, navy blue, royal blue. Always within the canons of the "morning dress code", but in this case, the family members and friends could participate at the wedding wearing a classical suit. Bespoke suits with one or two buttons, wide notch or peak lapels, ticket pocket and double vent. Wide range of patterns like wool silk, pure wool, cool wool, mohair wool alpaca, wool “fil a fil”, wool serge, wool herringbone, pinstripes, Prince of Wales, Madras. Suitable suits for a civil wedding with a classical and traditional taste. Flawless elegance evening men suits. Tuxedo and tail coat for a wedding in the evening and night, that will be celebrated in a cocktail ambiance, for gala events, evening luxury party or red carpet nights. Suitable bespoke suits for a wedding in the evening that will be celebrated in a cocktail ambiance. The most appropriate would be that the family members and closest friends, accompany the groom also wearing a tuxedo. We can choose amongst the models with shawl-collar or peak lapel, or the double breasted model. In this case, it is important to know that if you choose this model, the jacket has to be worm always buttoned up. Wide range of patterns like wool silk, pure wool, cool wool, shantung silk and velvet. Pure jacquard silk Dinner Jackets or aristocratic inspiration Smoking Jacket made of velvet red, burgundy, bottle green, purple, blue or black, with satin shawl collar, satin cuffs with satin trimmings. Inspired by the Smoking Jackets worn by the aristocracy men in smoking rooms, hence its etymology "smoking", because they met in private smoke salons to smoke cigars and drink cognac while discussing about politics and business. The tail coat is a suit for men for formal events that should be preferably worn in the evening. One of the most famous events where a tailcoat is worn, is at the ceremony for Nobel prices, other possible events are at Embassies, States dinners, coronations and theatre premières. Bespoke Italian tail coat with black satin wide peak lapels, black color made of pure wool satin, cool wool or wool mix, the excellence of elegance for gala events. Suitable wedding suit for evening and night time weddings and gala events. For a wedding in a traditional style, where the groom would like to give a contemporary touch, being in the morning or in the evening, in a church or in civil, a model of the Fashion Collection would be the most appropriate. Fashion wedding suit, slim fit and glamorous fabric. Evening suits for an alternative contemporary wedding. Evening suits tuxedo style and dinner jackets with modern slim fit for contemporary weddings. Discover the range of blue and burgundy colors. You could choose amongst a suit with one or two buttons and notch or peak lapels. Matching with 3 pieces with double breasted waistcoat and an ascot or a tie in pure silk jacquard paisley, to give a British touch, a waistcoat in pure silk jacquard coordinated with the accessory in satin in the same tone or to give a vintage touch, a waistcoat in Prince of Wales or Houndtooth pattern. Or if we prefer a cocktail style, we can choose an aristocratic inspiration tuxedo, Smoking Jacket, with satin cuffs, combined with a double breasted vest and a bow tie, perfect look for glamorous evening weddings. You could choose the frock coat model, that is inspired by the classical redingote, an exclusive wedding suit model created by Mario Moreno Moyano, creative soul for Ottavio Nuccio Gala. Matching with 3 pieces with double breasted waistcoat and an ascot or a tie in pure silk jacquard, or to give a British touch, a waistcoat in pure silk jacquard coordinated with the accessory in satin in the same tone. Matching also with 3 pieces with double breasted waistcoat and an ascot in pure jacquard silk, a waistcoat in pure silk jacquard coordinated with the accessory in satin in the same tone or a waistcoat in Prince of Wales or Hound’s-tooth pattern. Exclusive groom suit model created by Mario Moreno Moyano, creative soul for Ottavio Nuccio Gala, with the style of the morning suit in different colors and patterns like “fil a fil”, wool silk, cool wool, mohair wool alpaca, Prince of Wales, Hound’s-tooth, light grey, charcoal grey, anthracite grey, black, blue, navy blue, royal blue, burgundy or black, with satin contrast on the lapels. Wide range of combinations like 3 pieces of same pattern and color, or double breasted pure silk jacquard waistcoat, Paisley silk ascot or tie and another trendy combination could be vest and trousers in Prince of Wales of Houndstooth pattern, royal blue, pearl grey or burgundy. Enjoy these colors explosion, of fresh and light fabrics, suitable for garden weddings, beach weddings or alternative weddings will be celebrated in open places like gardens or on the beach. Suitable groom suits for spring or summer weddings or fashion events. For an amusing wedding in a “hippy” style, celebrated in a garden, on the countryside or even on the beach, with the closest family members and the everlasting friends. Suits in pastel tones and in very light qualities like cotton or linen, coordinated with bow ties, suspenders and colored socks. Floral blazers for men and double breasted vintage suits, that will give a very funny touch to a wedding in a romantic style that in inspired by the 60’s and 70’s. Pure fashion Italian suits with Gothic, Heavy Metal and Rock inspiration, made out of bespoke and luxury fabrics like pure jacquard silk, trendy floral pattern and brocades. For a wedding that will be celebrated in the evening, in an ambiance with music and a lot of fashion, where the groom is a man that likes to dress according to the latest trends and that for this day is looking for a suit that gives him emotions. Super fashion suits with details like embroideries, skull, dragons, chain, studs and accessories that make an amazing personal look without being extravagant. The Gothic Collection is a mix of emotions that sees the protagonist of a modern man, dark lover, mysterious but at the same time sophisticated with a romantic soul. Suitable Groom Suits for style alternative thematic weddings. 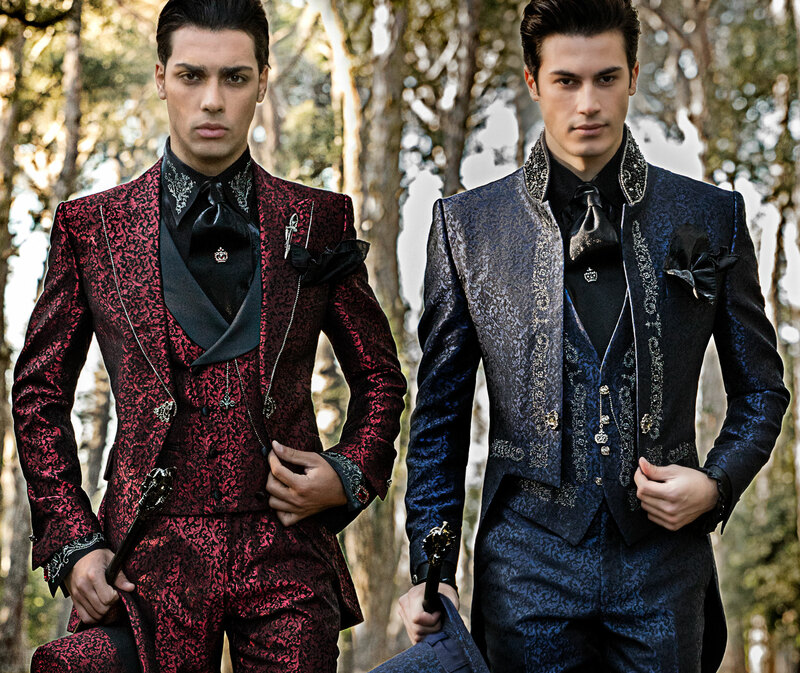 Created for a man who emphasizes his vanity, with redingote models, Mao collar and tail coats made in Brocade or Jacquard Fabrics, exclusive designs worldwide Ottavio Nuccio Gala. Luxury Suits with precious details as embroideries or crystal rhinestones, and embellished with metallic accessories in Gothic Style that make the strong personality in the choice of this line. A collection based on the importance of shades and of dark and marked coordination. An exclusive Ottavio Nuccio Gala for an impeccable total look with details like skull, dragons details or canes with a dragon's head and a skull. The Gothic Groom suit in suitable for Thematic weddings, in original locations needed for couples who have great personality and they want to make their day unusual and out of the standard. 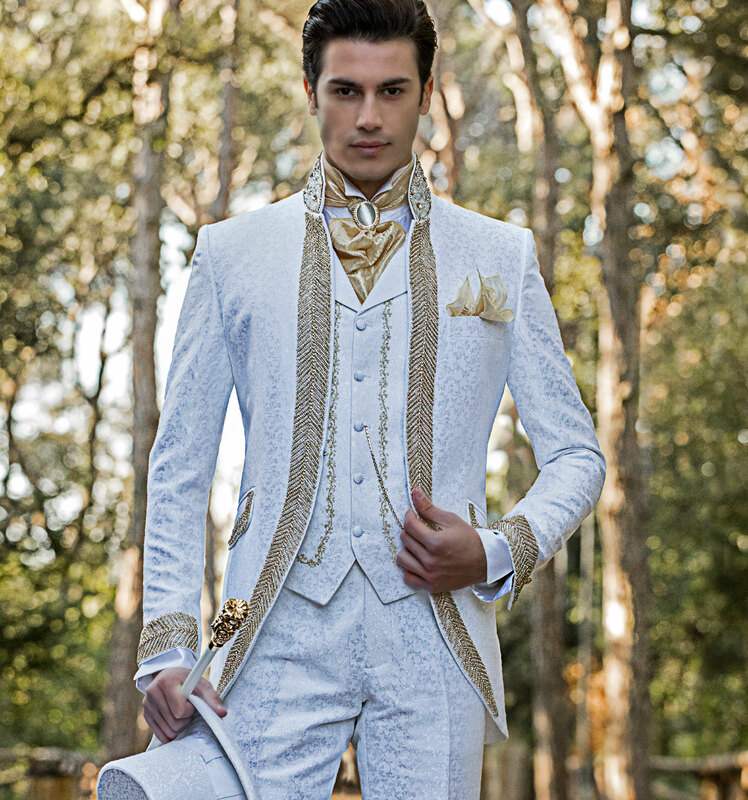 Suitable wedding suits for a couple that want to feel like princess and and prince for one day and enjoy a wedding full of fantasy and romance. The wedding can be in the morning or in the evening, in a church or in civil in a castle or in a palace in baroque style. Unique and exclusive models worldwide, inspired in XV and XVI centuries by the ages of enchantment. Frock coats and Redingotes, made out of exclusive fabrics, brocades and pure silk jacquard, embroideries, precious handmade details and perfectly matching accessories with the taste and the fantasy that such a romantic and legendary collection requires. Redingotes and jackets with precious details and handmade embroideries, always inspired by the ages of legendary warriors and designed in harmony to make the dream of a couple become true and make them catch the eyes of everyone. Mario Moreno Moyano, creative soul and product manager of the Italian brand Ottavio Nuccio Gala, offers you all the wedding suit models of the Collections: Gentleman, Black Tie, Fashion Formal, Fashion Color, Emotion, Gothic or Baroque custom made, bespoke and guarantees the experience of the service and the quality of the real “Made in Italy”, and an exclusive excellence worldwide shipping online shop service. Your desired custom made wedding suit with your measurements directly to your address. New times has come and only the best can offer excellence through the Online Shop! Welcome to online store of italian men wedding suits Ottavio Nuccio Gala. In these pages you will meet fully our news and collections, see our products in detail, compare their features and select to ship directly to your doorstep. We created this virtual space to enjoy the Ottavio Nuccio Gala firm shopping experience from anywhere in the world via the internet.Its design is simple and very easy to use. On the one hand we find access to the latest developments, both men wedding suits and accessories. In addition, Comercial Moyano organizes items by category, product and concept, providing the user even further easily purchase. Our online store is the perfect complement to our stores in Italy and Spain and the opportunity to offer our customers the best shopping experience 24 hours a day. The price of the suits contained in the web includes free shipping to your home. “Suit” prices include: jacket and pants (it might also include the vest, but only if indicated). You can add other accessories to your costume picture (such as shirts, ties, shoes, etc), in which case the price would be reflected on the right side under the category "Total Look”. Our regular production time is 45 days (Refer to urgent orders). We have an online store to facilitate the process directly from your home, you can make your order entirely online. Easy access to the latest collections of italian men wedding suits 2019, inspiration looks, the opportunity to enjoy the "newsletter" and personalized counseling, as well as a space to interact through social media, follow us and share with us your experience in our store.